Riyadh (AFP) – Saudi King Salman on Tuesday ordered that women be allowed to drive from next June, in a historic decision that makes the ultra-conservative kingdom the last country in the world to permit women behind the wheel. 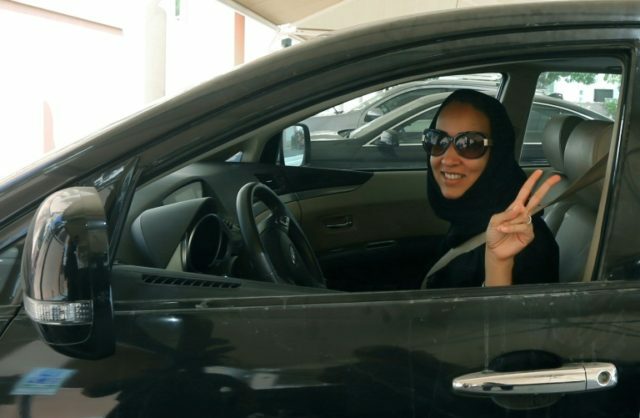 The longstanding driving ban was seen globally as a symbol of repression of women in the Gulf kingdom and comes after a years-long resistance from female activists. The decision, which risks riling religious conservatives, is part of Saudi Arabia’s ambitious reform push aimed at adapting to a post-oil era and improving its battered global reputation for its human rights record. “King Salman bin Abdulaziz al Saud has issued decree authorising the issuance of drivers’ licences for women in the kingdom,” Saudi state TV said. Conservative clerics in Saudi Arabia, an absolute monarchy ruled according to sharia law, have justified the ban over the years, arguing that it would lead to promiscuity. One of them claimed that driving harmed women’s ovaries. Many women’s rights activists were jailed over the years for defiantly flouting the ban. The shock announcement was met with a mix of euphoria and disbelief. “It is a testimony to the bravery of women activists who have been campaigning for years that… Saudi Arabia has finally relented and decided to permit women to drive,” Amnesty International said. It was unclear whether women will require their guardian’s permission to apply for a driving licence. The policy could socially liberate women — heavily reliant on foreign drivers and ride sharing apps — and also boost the economy at a time of low oil prices by increasing their participation in the workforce, experts say. Women were also allowed into a sports stadium — previously a male-only arena — to watch a musical concert, a move that chimes with the government’s Vision 2030 plan for social and economic reform. With more than half the country aged under 25, Crown Prince Mohammed bin Salman, the king’s son and the architect of Vision 2030, is seen as catering to the aspiration of the youth with measures that include promoting women empowerment. The US State Department hailed the new policy as a “great step in the right direction”, echoing a similar comment from UN Secretary General Antonio Guterres. “Allowing women to drive is the biggest PR win that Saudi Arabia — and Prince Mohammed — could have in a single swoop,” said Jane Kinninmont, a research fellow at London’s Chatham House. Prince Mohammed is set to be the first millennial to occupy the throne, although the timing of his ascension remains unknown. Already viewed as the de facto ruler controlling all the major levers of government, from defence to the economy, the heir apparent is seen as stamping out traces of internal dissent before any formal transfer of power from his 81-year-old father. His gambit to loosen social restrictions, which had so far not translated into more political and civil rights, seeks to push criticism over a recent political crackdown out of the public eye, some analysts say.